Ideally located in a quiet neighborhood by the sea, our spacious, light-filled, 55m2 / 590ft2 apartment offers you close proximity to the city center, fantastic city and sea view, fully equipped kitchen, free parking, laundry, Wi-Fi, Netflix access and privacy for you to live like a local. Fully licensed by the Icelandic Tourist Board. The apartment was fully renovated in 2016 and is perfect for couples and family friendly. It is located in Seltjarnarnes, a short drop from the old harbor and the city center of Reykjavik (5 minutes by car or 10 minutes by bus). Situated on first floor, the apartment has one bedroom with queen size bed (160×200 cm), a wardrobe, luggage rack, mini-library and blackout curtains. Quality linen and towels are provided. The kitchen is brand new and well-equipped for cooking at home. There is a glass-ceramic stove, oven, microwave, coffee maker, kettle, toaster, dishwasher, fridge and freezer as well as basic pantry items such as salt, pepper, olive oil, coffee and tea. The living room is bright and spacious, with 3m ceiling hight, dining area for up to 5 persons, sofa, 40” smart TV and Netflix access via Apple TV. There is fast fiber-optic wireless internet in all rooms. The bathroom has a walk-in shower and floor heating. Luxurious shampoo and body soap made from wild Icelandic herbs and a powerful hairdryer are provided. 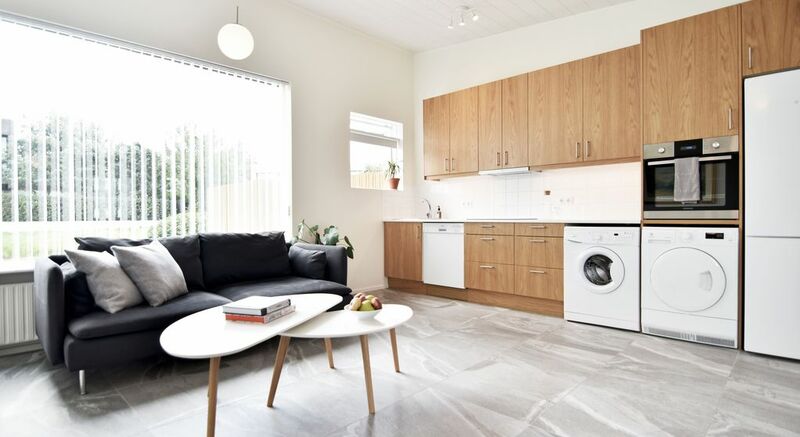 Private washing machine and dryer in the apartment, available for use at all times as well as ironing facility, clothes rack and hangers. The apartment offers views of the ocean, the mountains, the skyline of Reykjavik and the garden. There is only few meters walk to the coast, which has a great paved path along the entire peninsula, perfect for walking, jogging or biking. A few hundred meters north, there is Grotta lighthouse and nature reserve, the perfect viewing platform for the midnight sun and Snæfellsjökull glacier. Seltjarnarnes is characterized by beautiful coastal line, amazing views of the mountains and the city, quiet residential streets and its jewel, the nature reserve Grotta with an old lighthouse, a golf course, a couple of ponds and abundant bird life. At the same time this residential area is close to the many colorful cafés and restaurants of the old harbor and the city center. The house is located at the end of a blind alley, free from traffic and very close to the sea. The local swimming pool, Sundlaug Seltjarnarness, offers sauna, hot tubs and waterslide and is only 500m away. Within walking range (700m) there is also a mini shopping centre with a 24/7 grocery store, bakery, café, pharmacy, post office, liquor store and a bar. We recommend renting a car and there is free parking at all times. There is also a bus stop at the end of the street, 200m away and route 11 drives downtown every 15 minutes during weekdays and every 30 minutes in the evenings and during weekends . The bus ride to Lækjargata (city center) takes about 10 minutes. Check in is possible from 3pm and check out until 11am. We follow a strict plan of cleaning and quality assessment between each rental, which leaves little room for exceptions to our check-in and check-out hours. If you need an early check in you are welcome to to so if the apartment is available the night before your booking date, but this cannot be guaranteed. Basic spices, oil, tea, coffee. The local geothermal swimming pool is within 10 minutes walking distance. 25m long with 3 hot tubs, sauna and waterslide. Nice functional compact apartment with hassle free parking (a big plus in Reykjavik). The website does a good job of illustrating the apartments' features. The bathroom was larger than we expected with a nice shower area and heated floor. Ergonomic living area with adjacent kitchen (and good assortment of appliances). Easy to follow access instructions. Kjartan is very good with the details (much appreciated). Very quiet neighborhood so easy to sleep with the windows open and enjoy the cool breezes. Nice firm mattress on the bed. Walking path right by the apartment that goes straight to the closest supermarket (open until midnight, so good for last minute planners). Good running and biking trails along the coast. If you want to enjoy downtown Reykjavik its easy to take the bus from the stop down the street or its a short drive. For us the best feature was its solitude after a hectic day touring in the city and busy tourist district. The description of this property is really accurate. Extraordinarily clean. Location is very quiet with a great view. Short drive into old town. Most definitely will stay here again. I will say it was a little difficult finding the unit with the standard instructions. If you stay here I would suggest more precise instructions. Enjoyed this apartment very much. The bed was very comfortable and loved the heated floors! Would highly recommend, location was great, apartment was comfortable and clean. Comfortable, modern apartment, great location! This Reykjavik rental was a perfect, central location to explore Iceland. The apartment was clean with lovely furnishings, and very well appointed with views of the bay. The owner was fantastic to deal with and very accommodating. She provided basics such as coffee, cereal, apples, and electrical adapters that made our stay easier. She also allowed us early arrival and offered us late departure, which was much appreciated. Excellent restaurants and bakeries are minutes away. I would highly recommend this rental for your Icelandic adventure! This apartment is very spacious, well appointed, and has great views. It has all the necessities including a washer and dryer, dishwasher, and even has heated floors in the bathroom (a huge plus in the winter in Iceland!). It's in an upscale, quiet neighborhood with ample street parking, just a few short minutes drive from downtown. The owner provides an excellent information packet with maps and directions to all nearby grocery stores, restaurants, liquor stores and pharmacies. The owner is extremely responsive and helpful. Top notch rental in Reykjavik. Highly recommended!! Nice location and comfortable apartment. Nes Residence is ideally located in a quiet residential area, just 2km/1.5 mi west of Reykjavik city center. Next bus stop is 200m (220 yds) away and bus 11 drives to the city center every 15 min during weekdays and every 30 min on weekends. The drive from the apartment to downtown (stop at Laekjartorg) takes 11 min according to the bus plan. There is a grocery store, liquor store, pharmacy, post office, bar, swimming pool and ATM within 10 min. walking distance. The old harbor of Reykjavik with all its restaurants, cafés, shops and whale watching tours is just 5 min. drive away. Great walking and cycling paths along the coast. Grotta nature reserve, the best viewing platform for the midnight sun and the Snæfellsnes peninsula, is just minutes away. After exploring the area and enjoying the rich bird life, one can take a moment to unwind at the geothermal footbath located at the seafront. The 50km/30mi drive from Keflavik Airport to Nes Residence costs 13.500 ISK with a taxi, that is about 100$.